How does ochs und junior’s two time zones watch look on the wrist? And how do the 42mm (pictured above) and 39mm editions (pictured below) differ? 2 new wrist shots for comparison! Beat Weinmann lent his 16.5cm wrist for the photos. For both the 39mm and 42mm editions, the case height is 10.5mm and the lugs are 22mm apart. The ochs und junior date watch uses the same 2-part case designed by Ludwig Oechslin. The annual calendar and moon phase watches also use this case, but it is 11mm high. 42mm two time zones in titanium with a small leather strap and Ludwig’s titanium buckle: 62.3g. 39mm two time zones in titanium with a small leather strap and Ludwig’s titanium buckle: 53.6g. 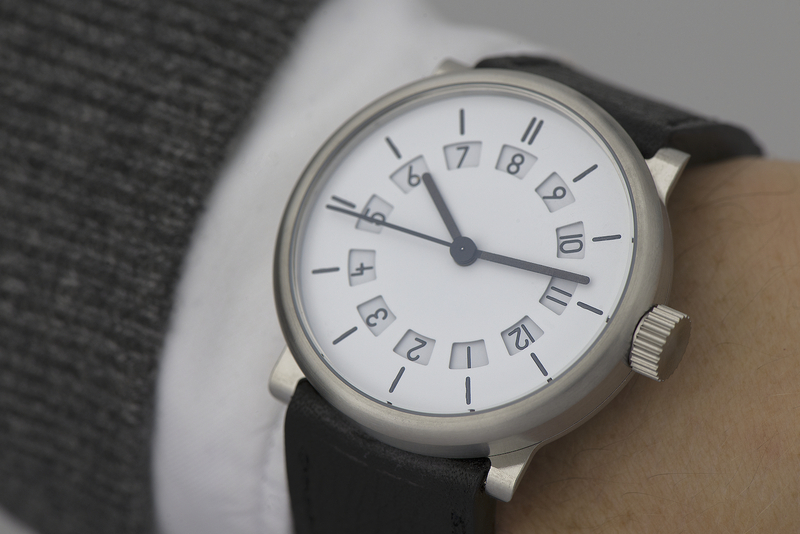 The white 39mm two time zones watch is pictured in our web store and ready to ship. 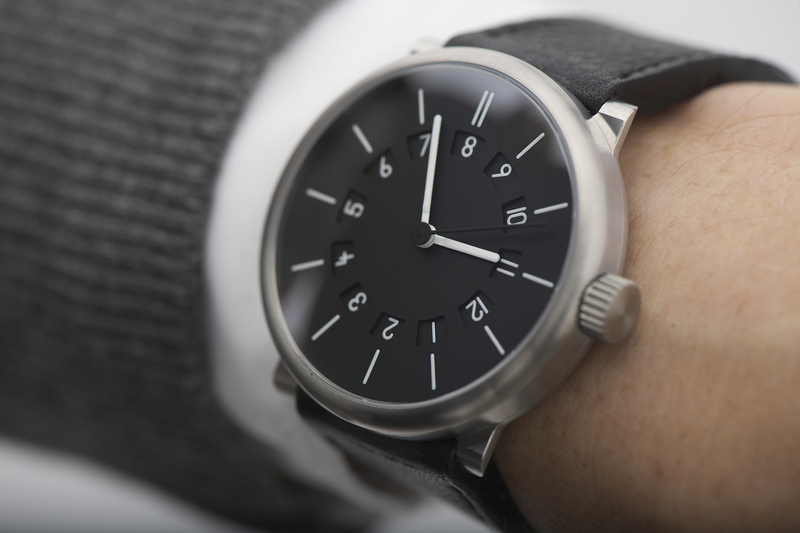 The black 42mm edition is at our workspace in Lucerne and also ready to ship – it will be in the web store soon! The price for each watch is CHF 6’000.- (incl. 7.7% VAT) or CHF 5’555 (export price excl. VAT). Please contact Beat Weinmann to purchase or learn more. Also, coming soon: pictures of a unique 36mm two time zones watch which was manufactured specially upon request for a customer in London — and which we could do again!